Okay, hi. I am actually really (really!) 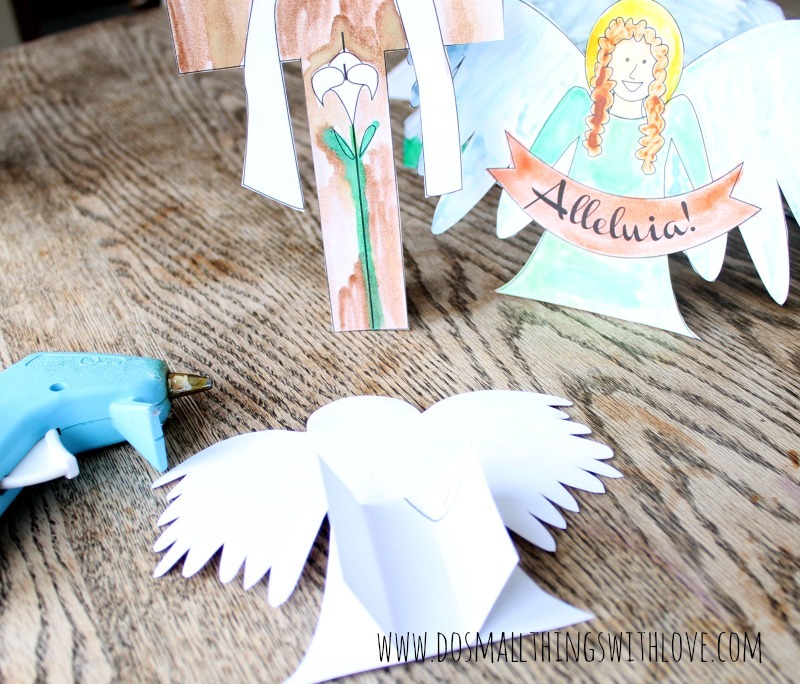 excited to share this project with you today: Easter Resurrection Set, free printable. It is much like a nativity set, which we all set out at Christmas, only this set celebrates the miracle of Easter. And I am thrilled to offer them as a completely free download! Yay! Just enter your email address right here, and the complete printable pack of Easter Characters will be sent directly to your inbox ASAP. And so, here’s what I’ve created. 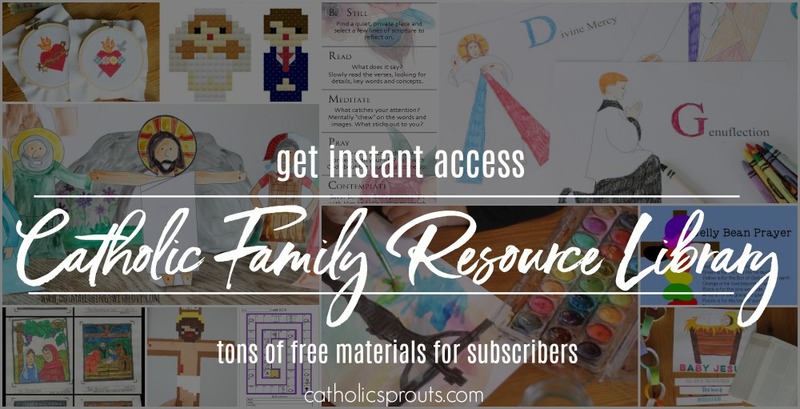 For your Easter celebration I have created 6 pages of free printables. All you have to do is print (on cardstock is best) and then color (I used watercolor, but you can use crayons, markers, whatever), cut, and glue on some simple stands to help them stand up. The drawings are simple. I don’t pretend to be an artist, but I think you can tell who is who. I also created an Empty Tomb and Empty cross for the set. All I did is cut a rough rectangle of cardstock, fold in the two side and glue the center section to the back of the figure, making sure that the bottom of the figure and the bottom of the stand were lined up. If need be, I also slightly trimmed the bottom of each folded side so that they angled up, just slightly. There you have it! 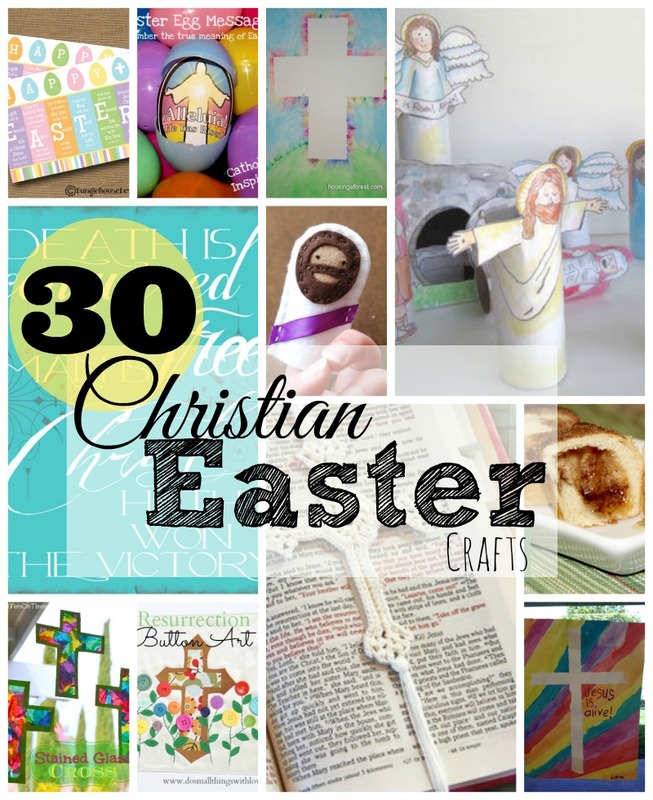 You are just a few printed sheets, some coloring and creativity from having a Easter Resurrection Set in your house this Spring. 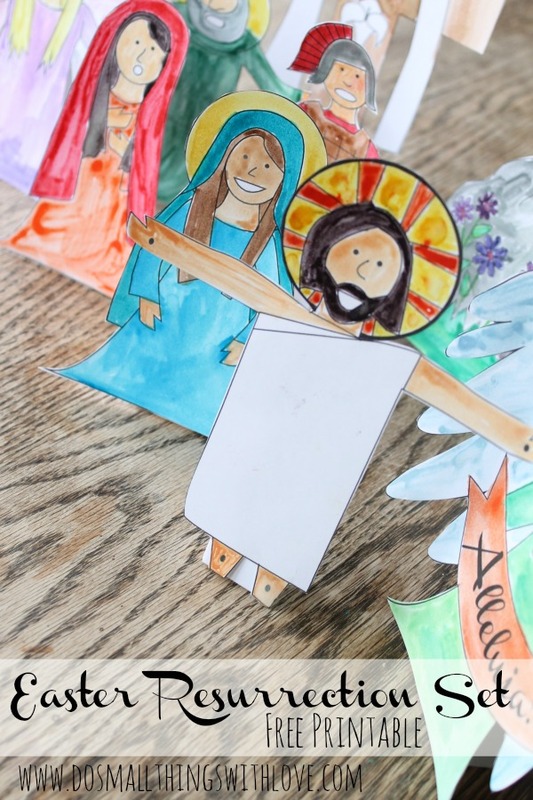 PS–if you do happen to print and make your own resurrection set this Easter I would LOVE it if you’d snap a picture and send it to me (nancy(dot)verly(at)gmail(dot)com) or shared it on my Facebook page. Pretty Please!! I purchased the crosstitch saint collection today for $3. Only problem is that I do not have color printer. The symbols for which color to use is not working. Would it be possible for you to email the code? Thanks so much. /8I really want to help you out, but i’m not quite sure what email the code means. Let me know and I will certainly do that. Sorry about the trouble! I purchased the saint crosstitch patterns today for $3. Downloaded all. Problem is I don’t have a color printer, so the keys don’t show me what color to use. When I tried to get back on the site it wouldn’t let me. Could you please email the color code for the saints. so I know which string to buy? Thanks so much! I hope they serve your family well! Thank you soooooo much for letting me know! I would love it if you could snap me a picture of the project so I can see it. And, happy (almost) Easter! Way to go picking this project back up! What a neat thing for your son to have a desire to do 🙂 Great work, Nancy! Sons are kind-of the best, huh Sky! Awesome collection for children’s church! So sweet! My son loves doing the Easter Egg Resurrection story (year round) so he’d love this. I’ll print these out this weekend so we can get started. Thanks! I hope they work well for your family! Thanks, Eva! I love this! 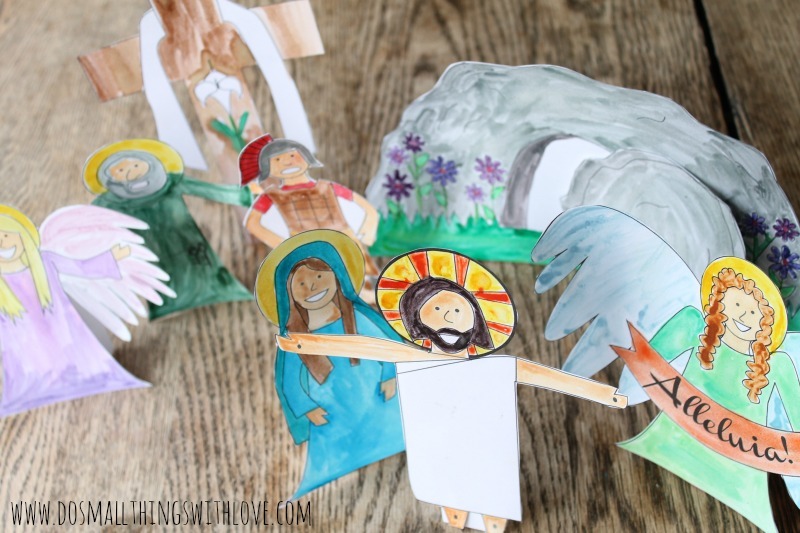 pinning and tweeting 🙂 what great printables to help teach the true meaning of easter! These are adorable! I’m so glad you finished them! This will give my boys something to do and maybe they’ll pay attention when we tell them the Easter story this year… Thanks so much! You are so sweet–and I am hoping for the same thing with my kids! Very cute! I’ll pass them along to my friend’s list! You are so sweet and wonderful, my friend! These are so special! I’ll have to see if LC would like to color them. He recently insisted on drawing all the Frozen characters and putting them on popsicle sticks like puppets, so I bet this would appeal to him for sure! I just love these!! I’m going to have to get some more ink in my printer and print these out for my kids! Going to check out your Easter craft roundup too. So excited to see more non-bunny crafts! I am thrilled that you like them! Enjoy and happy (soon to be) Easter!